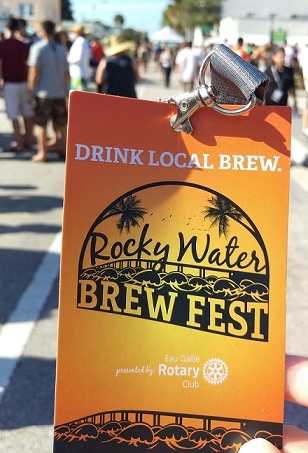 Last Saturday, the Eau Gallie Rotary Club presented the 2nd Annual Rocky Water Brew Fest, again at the Eau Gallie Arts District. 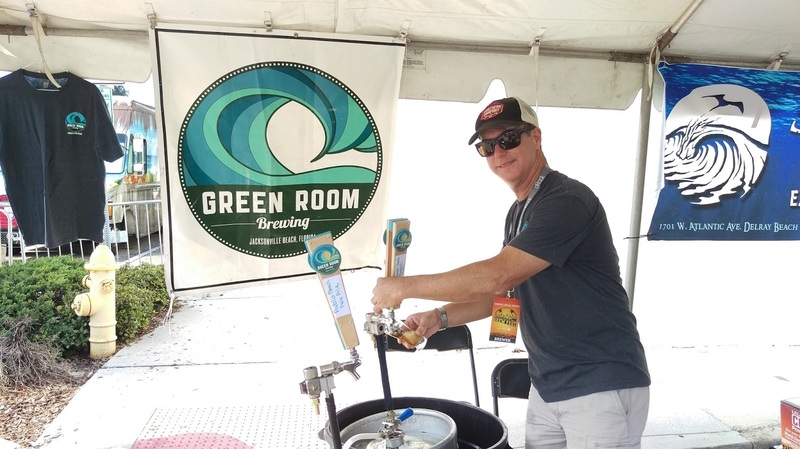 Leading up to the event, the organizers tempted us with some new breweries added to the mix this time. Still, all Florida, and now, a few more! 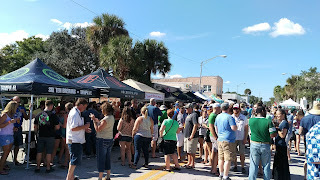 And, it looked like Mother Nature may have had a beer or two, because she was in a good mood this time around, as we soaked up the perfect sunny weather while wandering around the beer booths, drinking all that Florida beer and engaging in intellectual beer discussions! 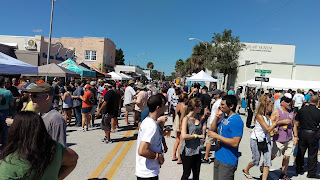 Somewhere along the way -- in between a few beer samples -- I was able to catch up with the guys from Rotary Club and Intracoastal Brewing Company, the event's partner brewery, located a couple of blocks away. The excitement that these guys have for this event is not only immediately apparent, but it's contagious! Not only did I enjoy talking with them in person here, but even our email and messages have been fun. This isn't the biggest beerfest that you'll attend in terms of number of breweries or gate attendance, but that's part of the draw, and it has that welcoming feel. 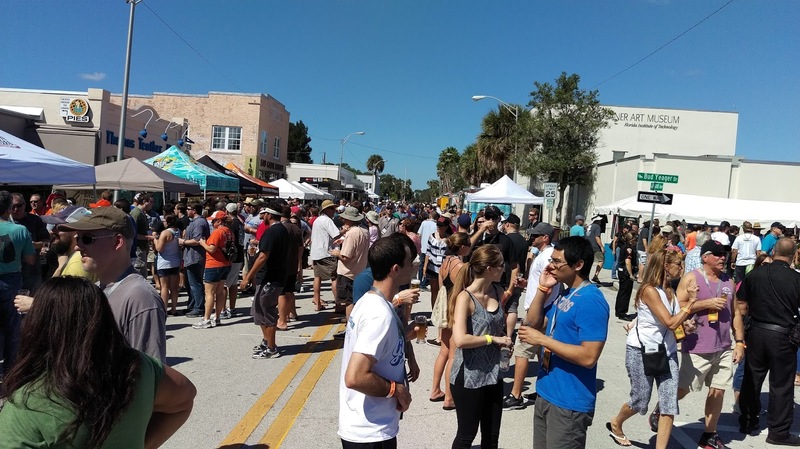 Situated along Highland Ave., this year's fest featured 28 Florida breweries, one meadery, and one winery, with each offering between 2 to 4 different selections. There were even some timed tappings. Beer enthusiasts were able to talk to the brewers and reps one-on-one about the beer and the breweries. 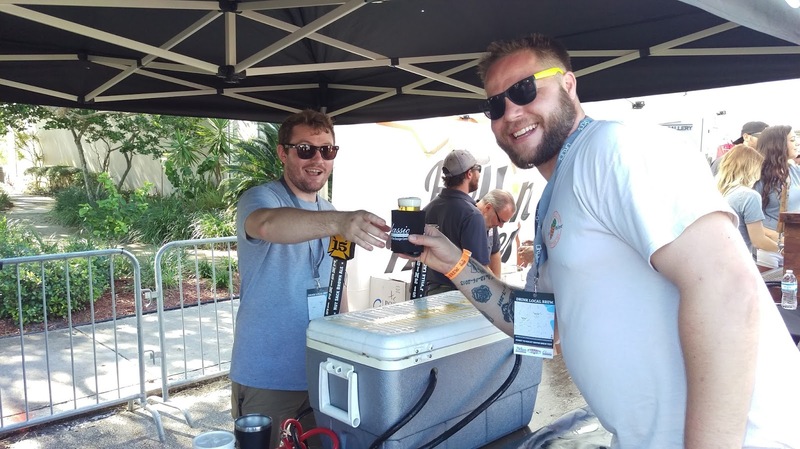 This fest is built to be beergeek-friendly: the set-up and number of breweries and attendees allows for quality interactions; so whether you're a homebrewer, beernerd or someone who just likes to drink beer (maybe all of those), you're sure to enjoy this one. 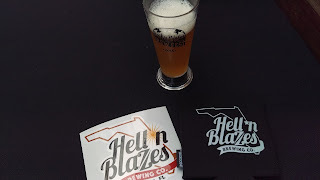 Local Melbourne under-construction brewery-in-planning Hell 'N Blazes Brewing had a steady line of traffic all afternoon, as you might expect. Anticipated opening date is January 2016. 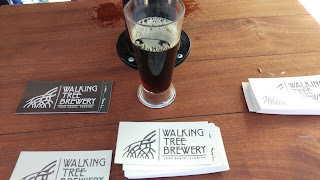 Another newcomer to the Florida brewery list is Walking Tree Brewery, under construction in Vero Beach. I really enjoyed their Root Fort Almond Brown Ale -- mild with a touch of almond flavor. 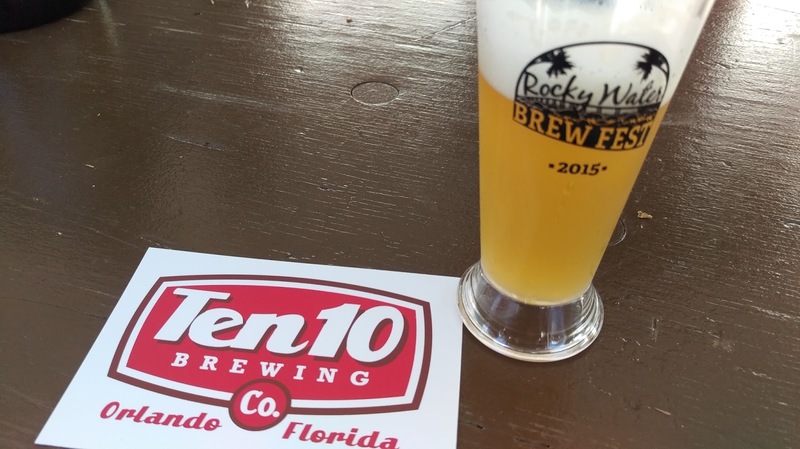 One brewery that I haven't physically visited yet is Ten 10 Brewing, which opened about 3 months ago just outside of downtown Orlando. 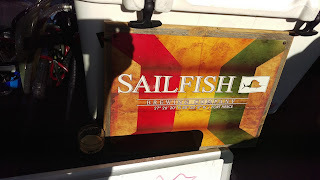 Their tap room features around 15 of their own beers. Yeah, that's another one on "the list" (it just keeps growing; I'm gonna need to win the lottery or stop spending money on food to keep making all these brewery visits). you don't see too much. A malty, easy-drinking brew. 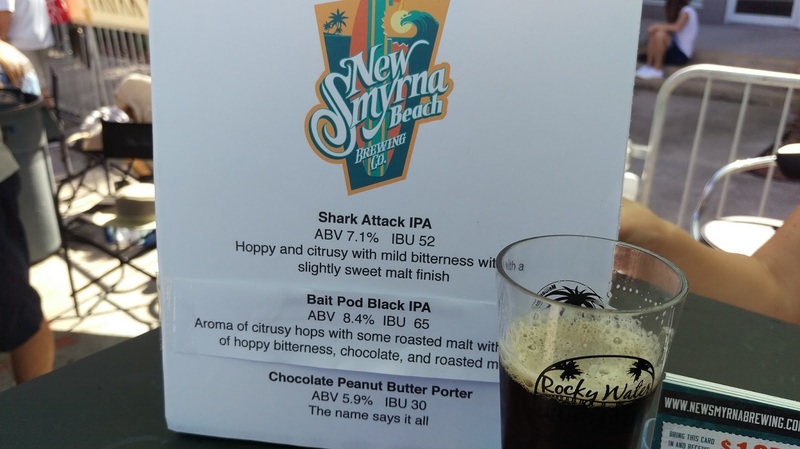 I won't list all of the beers that I tested/tasted/drank (that's what Untappd is for), but I have to give a shout-out to my friends at New Smyrna Beach Brewing, because I finally, finally got my hands on the elusive Chocolate Peanut Butter Porter (finally). It seems that every time I make it to the tap room, I just miss that one. I wasn't disappointed with the beer; some things are worth the wait, I guess. And, the new recipe Black IPA was awesome, too! I even caught up with a couple of Jacksonville favorites -- breweries with which I've become very familiar, since I'm there almost every other weekend with The Brew Bus: Engine 15 Brewing and Green Room Brewing. Always a pleasure! I'm ok with photobombs, but we took a better one! was a new one on me, and I really liked its sweet caramel. I'd be remiss if I didn't mention event partner Intracoastal Brewing, which had the popular lines all afternoon. And, not only is it local, but with beers like these, no wonder! 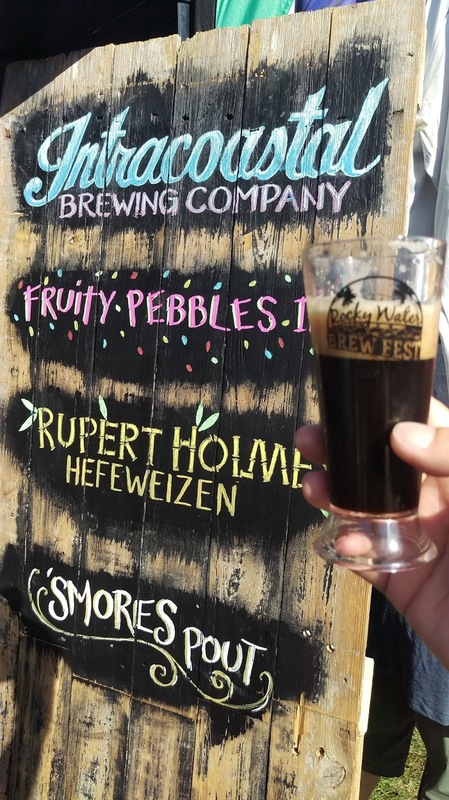 By the way, that "S'mores Pout" (yes, you read that right) is a 6.8% ABV porter-stout hybrid, overflowing with flavors of graham cracker, chocolate and marshmallow. That was some ridiculously crazy goodness right there! And, right next to that, Sailfish Brewing offered its Barista-Fish Porter, an 8.1% ABV delicious concoction with coffee, cocoa nibs and hazelnut; some heavy chocolate here. All styles of beer were represented here, and if you were looking for sours and Berliner Weisses, there was an ample supply. 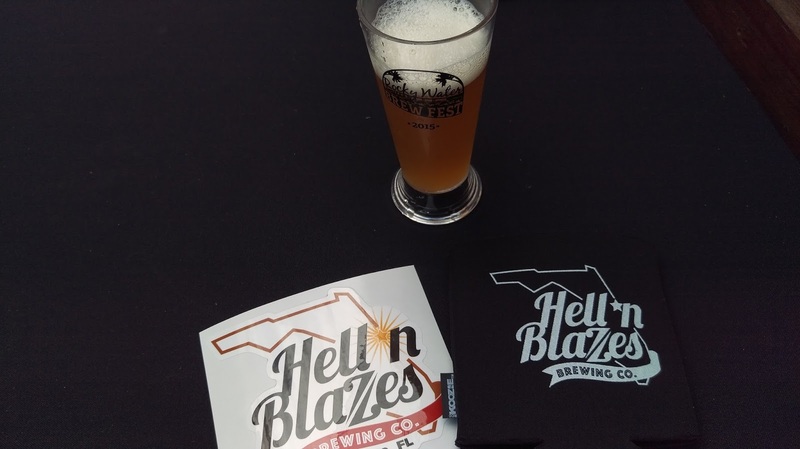 For the most part, the breweries participating in this event are smaller, and they came from all over the state. 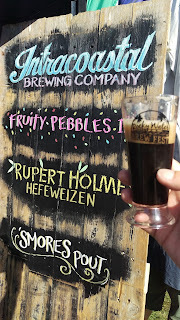 Although there were "only" 28 breweries (and one meadery and one winery) here, I didn't make it to a few of them, mostly because I eventually ran out of time-- every beer fest must come to an end -- and, I was probably talking too much, since I kept running into people ... who, me? imagine that! I love talking to all of you. And, I had a really great time chatting and hanging with the guys from brewery-in-planning Brevard Ale Works again. 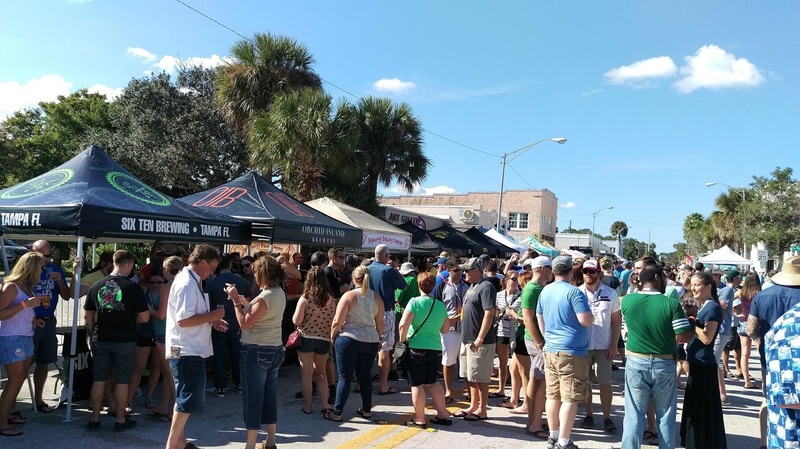 But, like I wrote last year, this fest isn't "just" about the Florida beer! 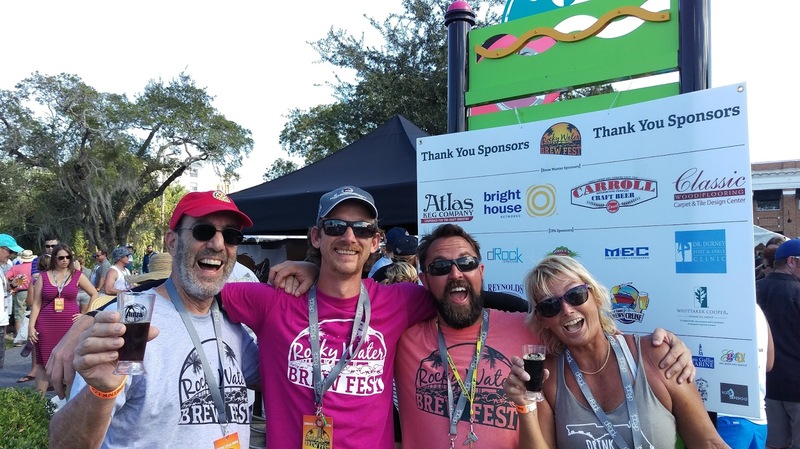 There's some serious money raised for charity here -- thanks to the sponsors, volunteers, and you beer enthusiasts. David Spector (the guy in the above photo who took his fashion chances by wearing a kilt, but liked the freedom), the past president of the Rotary Club who's responsible for disbursing the charity funds, informed me that last year's fest raised over $22,000 for international and local charities. Rotary Club expected to exceed that number this year. They're already planning for next year, and I already have a notation on my events calendar for Fall 2016. Thanks again to Mother Nature, and whoever served her that beer that kept her in a happy place all day. And, hey, if any of you were at Rocky Water Brew Fest, send me an email or comment via website, Twitter, Instagram or Facebook (I think that covers it)! I love hearing from you. I always like talking beer, beerfests, events, and the like. So, that's it this time around! Thanks for reading my blog and social media (I know, it's the photos). And, thanks to those of you who said Hi at Rocky Water Brew Fest. As always, see you around a beer.